Becoming (Oil, Metal Leaf on Panel; 60″ x 48″). 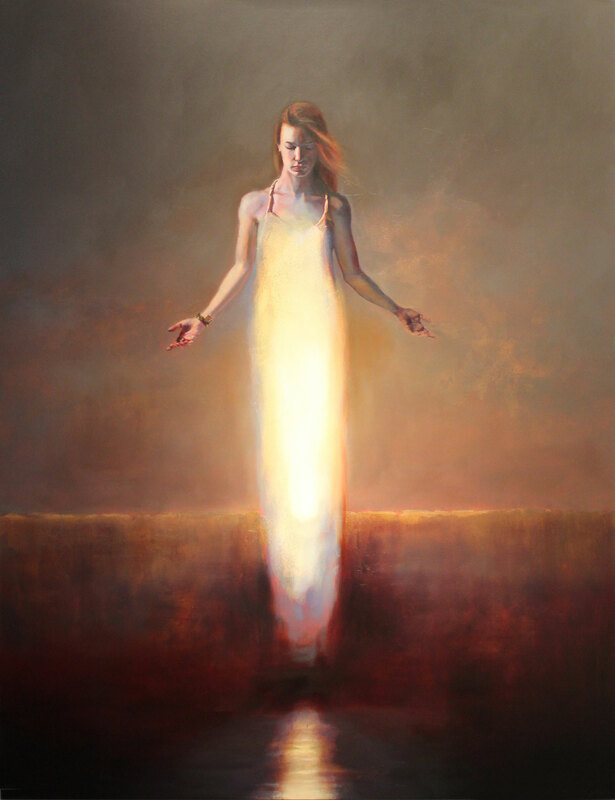 © 2012, Steven DaLuz, All Rights Reserved. No, there wasn’t an exact moment I knew. and became a cliff. Fall off me, I hiss in your ear. to the ground. See how our wants horrify us. other man unlucky enough to love me. is a Lebanese-American poet and the author of Set to Music a Wildfire (Southern Indiana Review Press, 2017), winner of the 2016 Michael Waters Poetry Prize. She is the recipient of a 2016 Ohio Arts Council Individual Excellence Award, the 2012 and 2013 Dorothy Sargent Rosenberg Poetry Prize, and the 2011 Copper Nickel Poetry Prize. Mark Granier‘s poems have appeared in numerous outlets, including Poetry Review, the TLS, Poetry Ireland Review, The New Statesman, Daily Poem and Verse Daily. Awards include the Vincent Buckley Poetry Prize and two Patrick and Katherine Kavanagh Fellowships. Ghostlight: New & Selected Poems was published by Salmon Poetry in 2017.
blues & whites of fall. & the moon’s so grown. Ellen Girardeau Kempler is an award-winning poet and nonfiction writer. Called ‘a timely and powerful selection of climate poetics,’ her first book, Thirty Views of a Changing World: Haiku + Photos, was published in December 2017 by Finishing Line Press. half the black grapes devoured. But all of that will come later. like a sparrow’s egg, in your pocket. stitched incantations into your lopsided chest. Now I’m tasked with naming your heart too? I take the last pull from the wine bottle. The rain starts its descent. Stella Reed is the co-author of We Were Meant to Carry Water, forthcoming from 3: A Taos Press. Winner of the Tusculum Review Chapbook contest 2018 for Origami, judged by Emilia Phillips, Stella teaches poetry to women in shelters through WingSpan Poetry Project in Santa Fe, NM. in the car ride over. at her driveway and 5 inches of snow. of the food past expiration. every desire fulfilled to whomever recites this. the kings holding gifts they can never give. Robert Walicki‘s work has appeared in over 40 publications including Vox Populi, The Fourth River, The Pittsburgh City Paper, Cabildo Quarterly and others. Robert currently has two chapbooks published: A Room Full of Trees (Red Bird Chapbooks, 2014) and The Almost Sound of Snow Falling (Night Ballet Press 2015). like a viola case to its instrument. its scripture stories of what came before. fuel our bodies only with what lived. out in the sun’s cleansing light. Lay it on the rocks. Laura Grace Weldon‘s first poetry collection is titled Tending and she’s seeking a publisher for her second. Her works appears in such places as Verse Daily, J Journal, Penman Review, Literary Mama, Mom Egg Review, and Pudding House. Chaun Ballard‘s chapbook, Flight, is the winner of the 2018 Sunken Garden Poetry Prize and will be published by Tupelo Press. His poems have appeared in Columbia Poetry Review, Frontier Poetry, Rattle, and other literary magazines. His work has received nominations for Best of the Net and a Pushcart Prize. before they became petals torn by bullets. whose bodies are bullet-riddled are cremated. by war, their lives the stories of war waiting to be told. eyes are filled with the fear of dying in exile. All my life I have waited for them to come home. Rasaq Malik is a graduate of the University of Ibadan. His poems have been published in Rattle, New Orleans Review, Spillway, Poet Lore, Michigan Quaterly Review, One, Minnesota Review, and elsewhere. He won Honorable Mention in 2015 Best of the Net for his poem Elegy, published in One. In 2017, Rattle and Poet Lore nominated his poems for the Pushcart Prize. He was shortlisted for Brunel International African Poetry Prize in 2017. He was a finalist for Sillerman First Book for African Poets in 2018.
and your helmet, slightly dinged. all the way home through the snow. Jane Clarke‘s first collection, The River, was published by Bloodaxe Books in 2015. In 2016 she won Listowel Writers’ Week Poem of the Year Award, the Hennessy Literary Award for Poetry and The River was shortlisted for the Royal Society of Literature Ondaatje Literary Award. I am the stupidest of all the stupid mothers. Use your brain, woman. Use your noggin. to discern the exit light. Lauren Goodwin Slaughter is the recipient of a Rona Jaffe Foundation Writers’ Award and author of the poetry collection,a lesson in smallness, a finalist for the Rousseau Prize for Literature and the Eric Hoffer Award in poetry. Her poems have most recently appeared in Pleiades, 32 Poems, Kenyon Review Online, Carolina Quarterly, and Raleigh Review. She is an assistant professor of English at The University of Alabama at Birmingham where she is Editor-in-Chief ofNELLE, a literary journal that publishes writing by women. a palimpsest, a half-remembered cliché. a dab of Coco Chanel behind each knee. up the Hudson River, sparkling in the sunbeams. Ross Thompson is a writer from Bangor, Northern Ireland. Most recently, he was shortlisted for the Seamus Heaney New Writing Award, placed joint runner-up in the Mairtín Crawford Award, and read ‘The Slipping Forecast’ on the BBC for The Arts Show. He was also commissioned by NI Screen to write a poetic sequence for the Coast To Coast project, and collaborated on a musical project with The Grand Gestures. Unglassed windows, no roof but blue. Rubs two floor-tombs too slick for script. Steam in the air, sun on grass, sun on stone. Birch in a window, in a valley, by a river. Lex Runciman has published six collections of poems, most recently Salt Moons: Poems 1981-2016, from Salmon Poetry. An earlier volume won the Oregon Book Award. A chapter discussing his work concludes Erik Muller’s Durable Goods: Appreciations of Oregon Poets. Now retired from college teaching, he lives in Portland, Oregon. to a different kind of school. on a string into his mother’s arms. Tim Suermondt is the author of seven books of poetry, the latest being The World Doesn’t Know You from Pinyon Publishing, 2017. MadHat Press will publish Josephine Baker Swimming Pool in 2018. He has had poems published in Poetry, Ploughshares, The Georgia Review and Prairie Schooner among many others. He lives in Cambridge (MA). When we picture Victorians, we often picture uptight women. What do we really know about these Pre-Raphaelite women? by day, either Guinevere or Morgana Pendragon; at night, women. in a bath tub), didn’t aim to be the tragic to cite for young women. had her face slashed by a soldier-boyfriend—not a fight over women. emancipation, Rossetti as her lover—no man had, by right, women. his biographers use it to demean model Fanny Cornforth, to indict women. Stephen Gibson‘s latest poetry collection, Self-Portrait in a Door-Length Mirror, was selected by Billy Collins as winner of the 2017 Miller Williams Prize from the University of Arkansas Press and was published this past January. He has published six prior collections: The Garden of Earthly Delights Book of Ghazals, Rorschach Art Too, Paradise (University of Arkansas Press), Frescoes, Masaccio’s Expulsion, and Rorschach Art. the forest’s sense of age and season. can’t be sunlight, let them make stars. Lisa Higgs‘ chapbook Earthen Bound will be published by Red Bird Chapbooks in 2018. Her poem “Wild Honey Has the Scent of Freedom” received 2nd Prize in the 2017 Basil Bunting International Poetry Prize. Currently, Lisa is the Poetry Editor for Quiddity and reviews poetry for Kenyon Review Online. Like a tourist and swims to his drowning. That claimed part of a lake for summer camp. The life-and-death before he gags and spits. Before price becomes a thing to ponder. The chests for the relief of rise and fall. A shared version of his recent drowning. Not once, that summer, is he recognized. Always, the lucky victim is a fool. A still life framed by memory’s limits. For story to spew at acquaintances. In the inability to comfort. Gary Fincke‘s latest collection is Bringing Back the Bones: New and Selected Poems (Stephen F. Austin, 2016). An earlier collection After the Three-Moon Era won the Jacar Poetry Prize, and his next one The Infinity Room won the 2017 Wheelbarrow Books Prize for Established Poets and will be published by Michigan State University. Or the East Village, to Brooklyn with Whitman or Miller or Auden. Christian exhortation to fix your business right. A tramp’s scrawled Kilroy or skull and bones or Jesus Saves. When I wasn’t going anywhere at all. Jordan Smith is the author of seven books of poems, most recently Clare’s Empire, a fantasia on the life and work of John Clare from The Hydroelectric Press. He lives in upstate New York and teaches at Union College. the words, as at your death, This can’t be real. over freedom, sleep, her bills all paid. over the silent shift of a decimal. Elise Hempel‘s poems have appeared in numerous journals, including Poetry, Measure, Valparaiso Poetry Review, The Evansville Review, Southern Poetry Review, and The Midwest Quarterly, as well as in Poetry Daily and Ted Kooser’s weekly column, American Life in Poetry. In 2016 Able Muse Press published her first full-length collection of poems, Second Rain. She lives in central Illinois. into and through the heart of town. or stage lights. Oh, one if by man, two if by dream. I fear he will…. He will. So brief. So snuffed. and cry, I swear it was a glorious moment. Wasn’t it? It was a failure worth staying up all night for. Matthew Murrey‘s poems have appeared in various print and online journals. He received an NEA Fellowship in Poetry a number of years ago. His first book manuscript is seeking a publisher. He is a high school librarian in Urbana, Illinois. in the blue to get another look, startled and curious, recognizing something neither can name. to childhood memories of the ocean: how a wave can be gentle even while the tide is strong. boulder as a flute’s lilting melody capered into the scene, each harmonizing with the other as they rose, intertwined, pausing at the peak before cascading into the valley with the morning sun. Ben Groner III (Nashville, TN), recipient of Texas A&M University’s 2014 Gordone Award for undergraduate poetry, has work published in Appalachian Heritage, New Mexico Review, Third Wednesday, Gnarled Oak, The Bookends Review, and elsewhere. those powdery crumbs snow melt. he fed himself broken bits of code. But why did he spy on the enemy? for a stinking hold, weevily brown bread. At dusk he passed a palm through flame. Gedenken und Frienden. Day’s end brings peace. a six-month child, a cousin’s mislaid bones. with gloved fingers, wiping cream from his beard. No place for Mezonot, the blessing on five grains. His suit, I think, would have fit a larger man. in chimney smoke and the holies of Siddur. Carol Alexander is the author of the poetry collections Environments (Dos Madres Press, Spring 2018) and Habitat Lost (Cave Moon Press) along with the chapbook Bridal Veil Falls (Flutter Press). Her work has appeared in numerous anthologies and literary journals. She has also published fiction and nonfiction for young readers.